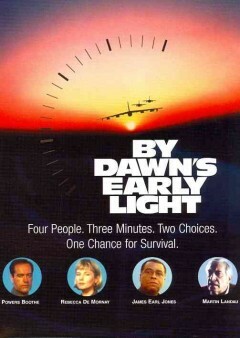 By Dawn's Early Light is a 1990 HBO military thriller based on the novel "Trinity's Child" by William Prochnau. The film is a fictional depiction of the events following a surprise nuclear attack on the Soviet Union by internal dissidents intent on provoking war with the US. 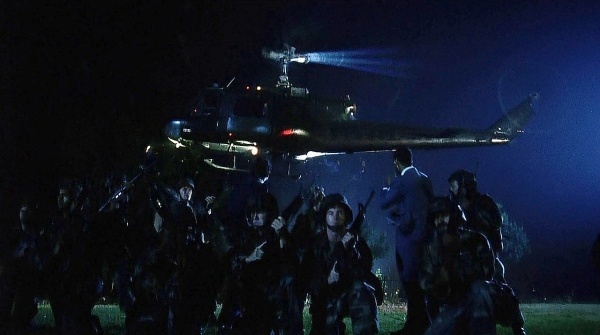 The M16A1 rifle appears in the film in the hands of US military personnel, first seen slung over the shoulder of a USAF Airman at Fairchild Air Force Base, then in the hands of Army soldiers covering the evacuation of the President (Martin Landau) from Washington, DC. The M16A1 rifle appears in the film seen slung over the shoulder of a USAF Airman at Fairchild Air Force Base. US troops armed with M16A1s guard the helicopter carrying the President. 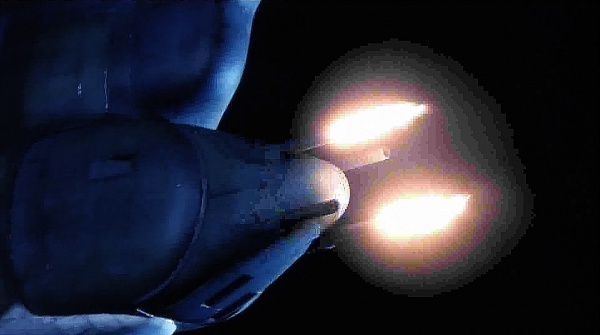 The Browning M3 heavy machine gun appears in the film as defensive armament on a US Air Force B-52G Stratofortress bomber, codenamed "Polar Bear 1" that makes up the film's sub-plot. At one point in the film, Polar Bear 1 comes under attack by a group of Soviet MiG-25 Foxbat fighters, the four tail-mounted Browning M3's being used to destroy one of the attacking fighters. 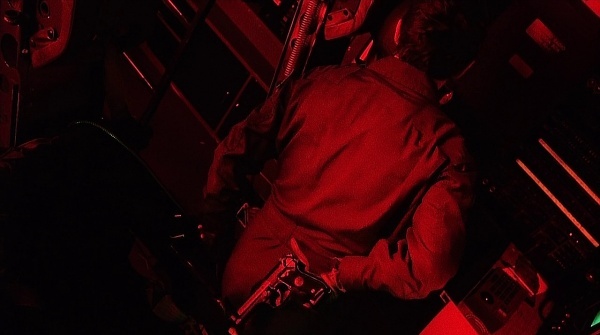 What are supposed to be quad-mounted Browning M3 heavy machine guns appear in the film as the defensive armament of "Polar Bear One", a US Air Force B-52G Stratofortress bomber. 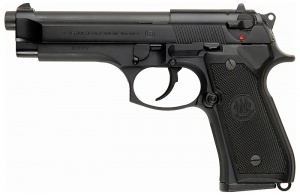 At one point in the film, a member of Polar Bear 1's crew, Tyler (Glenn Withrow) takes a Beretta 92FS (standing in for the military M9) and uses it to try to kill the rest of the crew when they defy orders to bomb Soviet leadership targets, though is disarmed before he can use the weapon. Another Beretta 92FS appears in the hands of a Secret Service Agent onboard the E-4 command aircraft. Tyler (Glenn Withrow) takes up a Beretta 92FS. 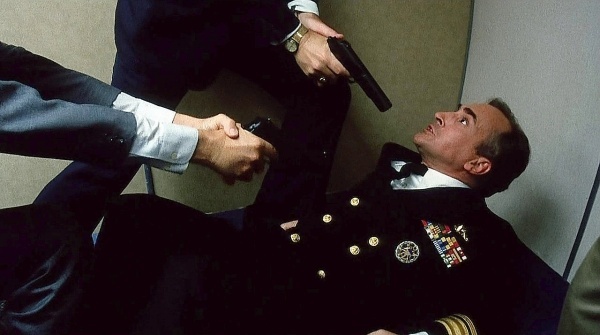 On the left, a Secret Service agent draws his Beretta on the Admiral (Jeffrey DeMunn), callsign "Harpoon." In addition to the Beretta 92FS mentioned above, another Secret Service Agent onboard the Looking Glass aircraft can be seen armed with an M1911A1 as his sidearm. 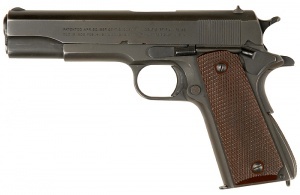 The use of semi-auto pistols by Secret Service agents in 1990 is incorrect; agents were typically issued Smith & Wesson revolvers, either the Model 19, or Model 66. At the top, a Secret Service agent draws his M1911A1 on Admiral Harpoon (Jeffrey DeMunn).